Rigabamboo here with another post from what I consider to be the best of the AJATT+ forum. Do you like 塊魂 (Katamari Damacy)? AJATT+ user Kalek does, and he has an epiphany that sentence mining should be like playing Katamari. Well, I realized that learning Japanese is like playing an especially long level in Katamari. You begin with picking up small sentences that come into your path that are easy to pick up, and if something is too big or hard, you ignore it for now. But, as time goes on, without even noticing, you’ll be picking up larger words, phrases, and even paragraphs/articles/etc. When you have a small katamari the size of an apple, and you try to pick up something big like a dog, it’s going to ruin your balance. This is just like trying to put a sentence or MCD that’s completely over your head into your SRS. Every time that card comes up, you’re going to be miserable. You’re going to lose your momentum, just like having a horribly lop-sided katamari. Luckily, with the SRS, there’s a simple solution. Keep items that are at or below your level. Lose ones that just exist to flummox you. However, we (especially including me) may feel the need to pick up all the little things before moving on to the bigger items, but it really is unnecessary, time consuming, and boring. What this game made me realize is that as my Japanese ability gets better, the little things will take care of themselves, probably without me even noticing them (just like I wouldn’t notice picking up a thumbtack off the ground when my Katamari is the size of a person, or a building, or even land masses). YES! Exactly. Imagine you were playing Katamari, but instead of only rolling up items directly in your path that enticed you and going for the fast win, you forced yourself to constantly stop your momentum pick up EVERY. SINGLE. ITEM. around you. You have a katamari the size of a house, but you still trudge over to every little thumbtack. Just thinking about how dull that sounds makes me want to never play video games again. And yet that’s what many try to do in their quest for Japanese perfectionism. We want to roll up every kanji, every vocab that we see in our immersion environment, even if it’s mind-numbingly dull, because we think we “should.” Forget the perfectionism. Forget what you “should” learn. Just grab the items that are directly in your path and look fun. 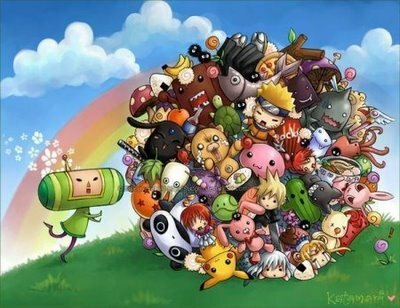 You’re listening to, watching, or reading Japanese – you’ve got the katamari rolling. Don’t constantly stop it to pick up every little thing. Just keep rolling and occasionally grab something simple and fun. But the main part is, keep rolling the katamari. Stuff will cling to it naturally. Just… please… don’t make video games a chore. Former video game tester here. They’re already a chore. Great article though! You’ve never played Ragnarok Online?! Porings are the cutest things alive. This is getting really off-topic, but there are lots of private servers for Ragnarok Online. I’m sure at least one of them would be Japanese. MMOs aren’t fun for a super long time, anyway, but I mean, if you like RPGs, you could at least look for alternative options like the one I mentioned. Sometimes it feels more like grinding. Exactly what Japanese Level Up is talking about. Catching up on a two-week-long backlog of Anki reviews (Achievement Get! – Three-Day Monk Green Belt) feels almost like repeatedly going through Petalburg and stomping Goombas to get enough Star Points to fight Rawk Hawk, a miniboss from three chapters later. (Sorry if you don’t get it, the “Paper Mario” and “Mario & Luigi” series are the only RPGs I’ve actually been able to get my hands on.) Or going back to the katamari comparison (again, haven’t found a copy of that game), having a car-sized katamari and trying to pick up sand. Well, I’ve got 600 grains of sand stuck in my 靴 right now (200 shaped like kanji, 250 of the vocab type, and 50 unknowns), and good grief I want to get past those already! Wow, that train of thought went out the 窓 in a hurry. I decided to start my 4th video game in Japanese, and also the first one with Kanji yet without Furigana (I played Pokemon HG and the two NDS Zelda games in JP). This 4th one is Super Mario RPG, a game I’ve always kept going back to (so hey, I already know the story!). I wish to place my focus on reading Kanji, now that I can recognize them all. What I do is simple: I read through everything (doesn’t matter if I don’t understand), and if I stumble upon a Kanji word I don’t know how to read, I look it up and add it to my new vocab deck (I’ll review it later). So far, it’s going quite great and I’m having fun, especially when doing links with words I’ve found often in previous games. I plan to always increase the level after finishing a game, so that there’s always more Kanji to be found, but never an overwhelming amount.